These buses leave every hour day and night. Just jump on board. The assistant conductor will collect the fare once the bus is underway. Ceres Liner runs several buses a day that drive onto the ferry (RORO – Roll-On Roll-Off) and come all the way here to Bantayan Island. The end stop is in Bantayan Municipality, but you can get off at the Santa Fe Port and take a bicycle taxi or tricycle to your resort. You will pay the 225 pesos fare on board the bus. According to the drivers there is no method in place to purchase an advance ticket. The bus passes by downtown Santa Fe, so you can get off anywhere along the way if you’re staying in the town center area. Just let the conductor know when you want to stop and they’ll accommodate you. The benefit to the direct bus is that you don’t have to carry your bags onto the ferry by hand or negotiate with porters if you have a lot of luggage. It’s a bit more convenient to take the direct bus if you’re traveling with children or a larger group of people. For backpackers and people traveling light, just jump on the next bus heading to Hagnaya Port. Notes: ALL bus ticket prices listed above do not include the cost of the ferry ticket (180 pesos regular fare) or the port terminal fee (10 pesos). Also, the buses sometimes advertise that they have free wi-fi on board, but in our experience it usually never works. If you’re returning to Cebu and are trying to get to the airport, the drivers recommend you get off at Pacific Mall. You can take a taxi to the airport from there. Just let the assistant conductor know that you’re going to the airport and he’ll make sure you get off at the right stop. 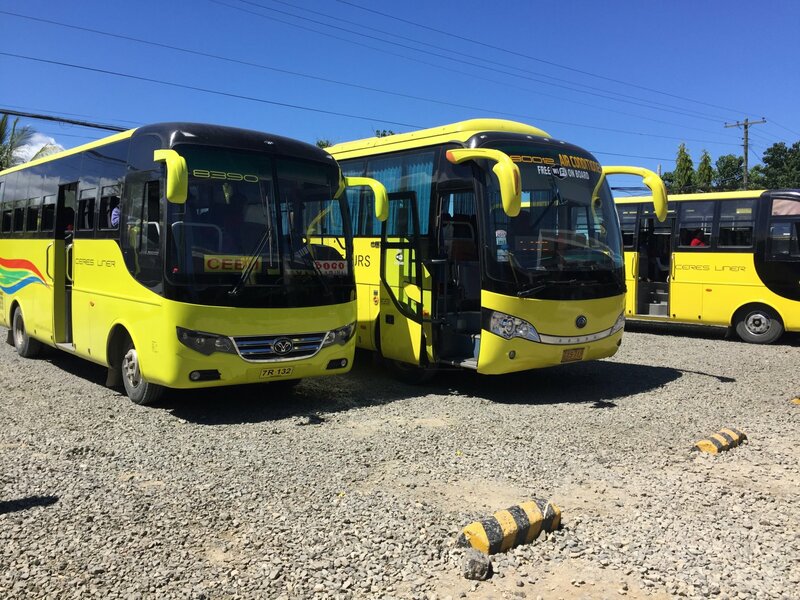 The direct bus from Bantayan Town to Cebu City travels to the South Bus Terminal first, and then it goes to the North Bus Terminal. Great guide but missing date of writing for this article! Where do you ride the bus in bantayan island going to the airport? Thanks! fare rates is 225 bus plus 180 ferry and 10 for terminal fee.. no other expenses for fare rates? im wondering about if i take a ferry at 6am. then will i have enough time to get on the 7;30 am bus to cebu? There will be buses waiting when the ferry arrives at Hagnaya Port. Just jump on a bus in the back lot. It will leave for Cebu as soon as the passengers get loaded. Are the rates still the same? This is the OLD Schedule! First trip is 930P, backup s 1015P, then 12midnight, the rest is correct. Is the first trip @3.15am from Bantayan municipality, right? No need to jump off the bus, it goes direct to Cebu. Is that right? Is it convenient to take the bus in Ban or Santa? And how much cost from Santa Fe port ferry terminal to Cebu North Bus Station? Sa Management sa Ceres Liner… Naa mi gipadala na six (6) styro boxes ug ang iyang plete Php 150.00 per boxes mi-total ug Php 900.00 tanan. Karon nangayo pa ang conductor ug kwarta para daw sa driver ug sa iyaha. Karon kay Php 50.00 ra man among gihatag, gitawagan dayon sa conductor ang ang Inspector ug gipa-estorya mi, ngano daw na 50 pesos ra amo gihatag nga daghan man amo gipakarga. Ako gitubag na wa man mi budget ana, ako ra gani na kaugalingon kwarta 50 pesos (hadlok man sab ko basi binuangan amo karga). Karon ako pangutana mao ba diay ni pamalakad sa inyohang Ceres Padala kay gi-tolerate man sa inpector ang gihimo sa conductor. Kini nahitabo dinhi sa Bantayan Island. Ang cell no. sa inspector 09756559852 kay dili man siya magpaila. 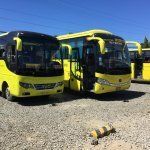 Ang sa conductor Lepiten – 09128409152, Ceres Body No. 875 ug ang plaka ABL3257. Palihug lang ko hatag ug tubag ani kay mi na tigpadala, gamay ra ganansiya namo. Do you have a number in your Ferries Bus? What if naa mi gipa sakay og last trip from. Northbus to bantayan what time maabot? Please how long bus journey cebu bantayan. Hi, do they have the same schedule as of today? I stay in Santa Fe . Were can we take te bus to cebu ? Were can we get on? In the harbour of Sante Fe? What are the times?